I would like to introduce you to my friend, opphämta. Opphämta has spent a lot of time in my studio lately. I probably don’t pronounce her name correctly, but I sure am having fun with her. Opphämta, or upphämta, is a Swedish weave structure in which the pattern thread forms the design over a plain weave ground. In a way, she reminds me of overshot, only without the half-tones. Like overshot, she is often woven in wool on a cotton plain weave or basketweave background, and often used for coverlets. 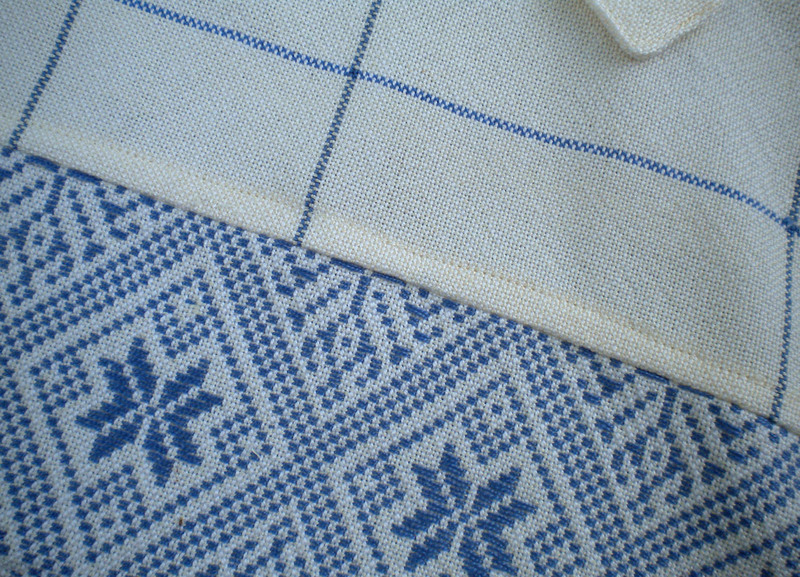 Unlike overshot, the pattern thread is either on the face or on the reverse; there are no tie-downs which in overshot create half-tones, so long floats can occur. The patterns can often be traced to specific regions, are usually symmetrical, can be woven as borders or as all-over designs. Opphämta was originally woven by picking up the pattern with a weaving sword. Although I’ve never tried to weave it with a sword, I have woven it on a draw loom which I’m sure is much faster than a sword. Although “fast” is a relative term for a draw loom. Many years ago, I wove opphämta borders for some aprons, and decided to revisit that project. 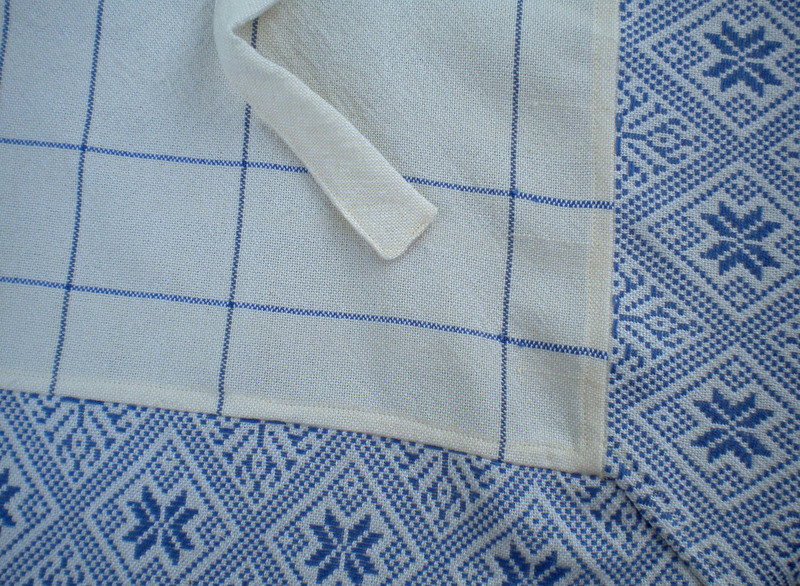 Those aprons were a traditional bib-type design, with the opphamta border running along the hem and across the top. Two patch pockets also sported patterning. 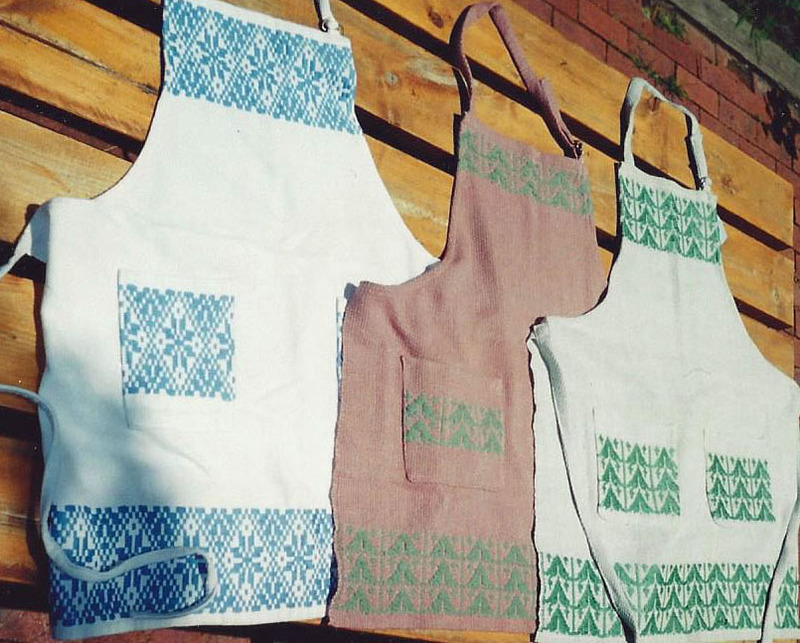 My current project is inspired by a diamond-shaped apron my Mom sewed for me some years back. She was a quilter and her apron showcased her patchwork skills. I borrowed her apron’s shape, applying opphämta borders instead of patchwork along two sides and again across the top. This is a work in progress. There are so many possibilities with this technique and it will be an adventure to see where opphämta takes me.